A conceptual understanding of the nature of human advancement. Practical techniques to help us cooperate effectively with this process. An inclusive and ever-growing framework for the unfolding of individuals, groups, and the planet. Psychosynthesis is an inclusive approach to human growth that dates from 1910 and the early work of the Italian Psychiatrist Roberto Assagioli. Assagioli was one of the pioneers of Freud’s psychoanalysis in Italy, but he maintained that Freud had not given sufficient weight to the “higher” aspects of the human personality. Assagioli recognized a need for a more inclusive concept of humanity and a system (which he called Psychosynthesis) that would help humans come together within themselves as well as with each other and their world. From this beginning Assagioli – and an increasing number of psychotherapists, educators, physicians, social workers, clergy, and others – worked to develop and refine this inclusive view of human growth. It is an exciting task that continues today – and will never to be finished. Each year, new discoveries in psychology, new developments in education, religion, anthropology, physics and other disciplines, add to the principles and to the techniques of Psychosynthesis. Psychosynthesis, by its very nature, is always open to new approaches to human development. Any comprehensive psychological and educational approach to the development of the whole person must draw from many traditions. Eastern and Western traditions, for example, come together in Psychosynthesis. While Eastern disciplines often have tended to emphasize the spiritual side of being, Western approaches usually have focused on the personality level. Psychosynthesis thinking and skills help us recognize that we have a “transpersonal” essence, something greater than our “ordinary” selves. We know our purpose in life is to use all our parts and powers to manifest this essence, or Self. At the same time, we want to experience this Self as fully as possible in the world of everyday existence – we want to be fully present in our personal and social lives. We humans need to view our humanity as a single whole and accord each aspect its due importance. Over the years, a number of conceptual points and a number of methods have proven themselves to be fundamental. These provide a working structure for Psychosynthesis. Prime examples are Assagioli’s expansive “Oval” diagram (or “Egg” diagram) showing the areas of the psyche, or mind, and his “Star” diagram, a picture of our main psychological capabilities or functions. In the personal psychosynthesis stage, our personality integrates around the personal self, and the individual attains a satisfying, “healthy” level of functioning in terms of work, relationships, and general living. In the transpersonal psychosynthesis stage, we learn to stay aligned with the transpersonal Self; to bring into play transpersonal energies, such as responsibility, the spirit of cooperation, a global perspective, love, and purpose; and to listen for inner guidance and wisdom. Often the two stages overlap: We can begin our transpersonal awareness and action long before our personal integration is complete. Any method that assists in the evolution of a human being is useful in psychosynthesis. To be as effective as possible in guiding ourselves or others, we clearly need to have a broad range of methods and techniques to meet the needs presented by different situations and people. We treat each person as an individual and choose the methods best suited to each person’s existential situation, psychological type, goals, desires, and path of development. We commonly use a wide range of methods in the process of talking about life events. These methods include guided imagery, movement, gestalt techniques, self-identification, creativity, meditation, will development, symbolic art work, journal keeping, development of intuition, and many more. The emphasis is on fostering our own or our client’s ongoing process of growth in order to experience ever more joy, balance, and actualization in life. As this process goes on, we gain freedom of choice, the power of decision over our actions, and the ability to direct many of our personality functions. We develop the “personal will,” the will of our personal self. We free ourselves from habits of helplessness. We drop preprogrammed reactions – to our inner impulses or to the expectations of people around us. We become gradually more “centered” and able to follow our own path, guided by our inner knowing, or true Self. As we reach toward experiencing the transpersonal Self, we liberate new strengths: we encourage synthesizing energies that organize and integrate our personality. We make ever-increasing contact with our “transpersonal will,” the Will of our transpersonal Self, which provides clearer and clearer meaning and purpose in our personal lives and our social tasks. We become able to function in the world more serenely and effectively, in a spirit of cooperation and good will. Psychosynthesis is a powerful and effective mode of holistic therapy and is gaining recognition in the psychological and therapeutic world. It is also a positive and dynamic framework from which to view the evolution of our planet. As people use Psychosynthesis principles and techniques effectively in education, medicine, politics and business they are spreading them to a wider audience, developing a broader range of techniques, and discovering greater depth of understanding. 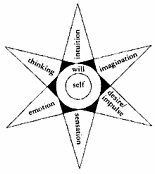 Assagioli’s “Star” diagram shows the relationship our Self has to our personality and our psychological functions. Psychological functions are the basic capabilities we rely on for awareness and for taking action – both internally and in the world. Assagioli’s diagram, with its wide variety of functions (intuition, imagination, sensation, etc. ), makes it clear how complex – and unique – people are: each of us relies differently on the various functions, emphasizing some more strongly than others. This map also points to the variety of ways we have of creating change. We can use any psychological function and begin a process that changes us as a whole person. The various techniques in psychosynthesis draw on the various functions. Assagioli’s “psychological laws pertaining to will training” explain the processes we use to create change. For instance, when he states that “images or mental pictures and ideas tend to produce corresponding physical conditions and external acts” he shows the creative power of imagery and the mind. This map is a gift in that it gives a hint of the wholeness and richness of the human being – and of the certainty that growth is possible. The lower unconscious – the arena of repressed and traumatic memories, fundamental drives and impulses, and elementary psychological functions. 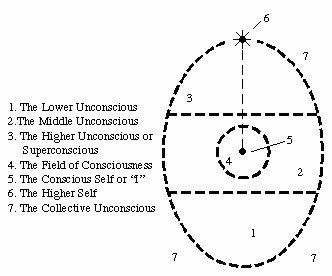 The middle unconscious – similar to our ordinary waking consciousness and easily accessible. The higher unconscious – the elements of “transpersonal” experience that connect us to others, to the larger universe and the world of spirit. The collective unconscious – defined primarily by Jung as the unconscious that carries archetypal experiences, the communal knowledge humans share with other humans all over the globe and through the ages. Assagioli indicated the varying levels of unconscious with dotted lines, illustrating that these states are not rigid: they blend into each other. The same is true for the field of consciousness at the center: we can refocus our awareness from moment to moment. The Self, in this map, describes both the “I”, (a center of awareness and choice operating at the ordinary personality level) and the Higher Self (the center of awareness and choice in touch with the transpersonal dimension – our larger experiencing of others, the universe, and spirit).